I can't believe that the time has come to bid farewell to 2015! I have been in a mood of reflection while I watch the girls play with their holiday gifts. It is hard to believe how many changes we have made this year. Even though we have a plan and things are falling into place within that plan, it all still feels very surreal. I still wake up and can't believe that we have actually accomplished so many of our goals this year. I stand back and look at Empyrean in her slip and can't believe she is actually ours, all ours! We are really doing this! This year has been such a whirlwind of happenings, really all for the good! 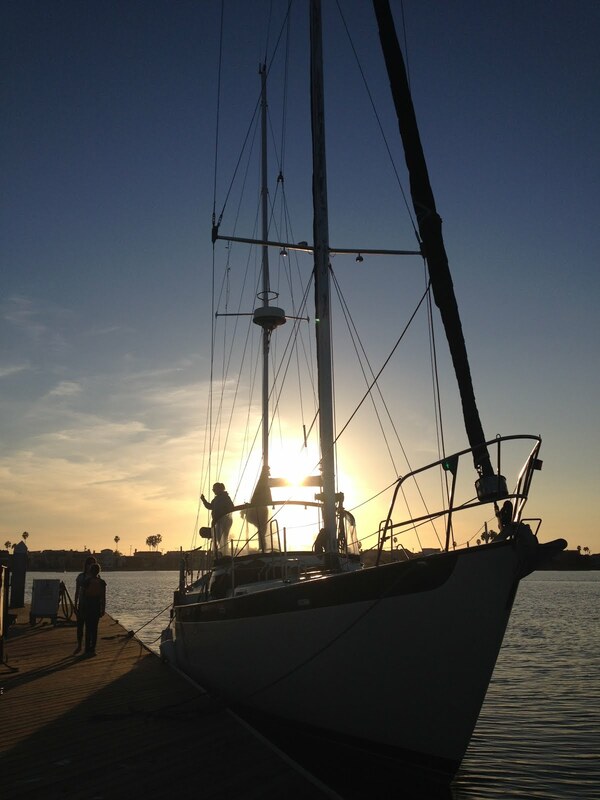 We launched Southwind, then we sold all of our belongings, moved into our trailer and purchased Empyrean! The girls have all adjusted so well, it is amazing! We had a tiny Christmas, which was a change from our much larger Christmas tradition, but it really felt good. The girls didn't ask for a lot and everyone was really happy with the few items that they each received. 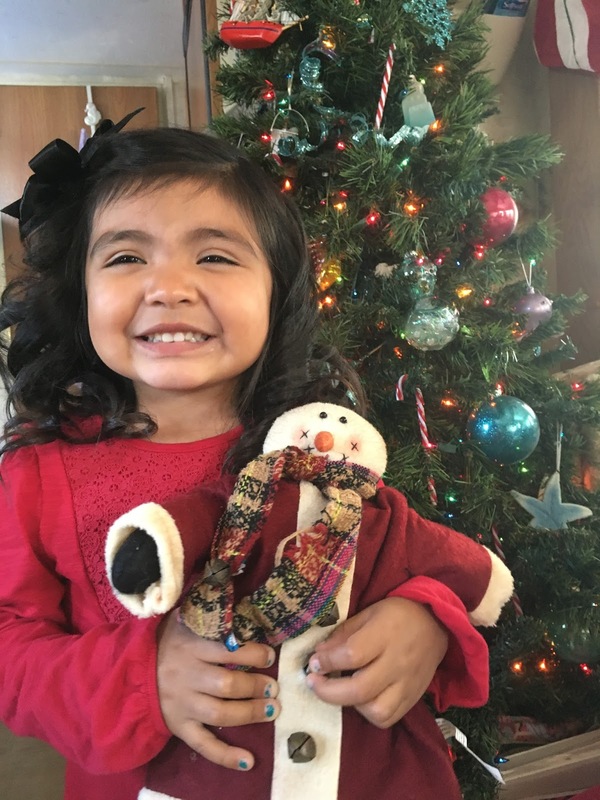 Zoey, who is 3, asked only for a backpack from Santa and has been thrilled filling it with items that send the rest of the family into a frenzy searching for missing necessities. 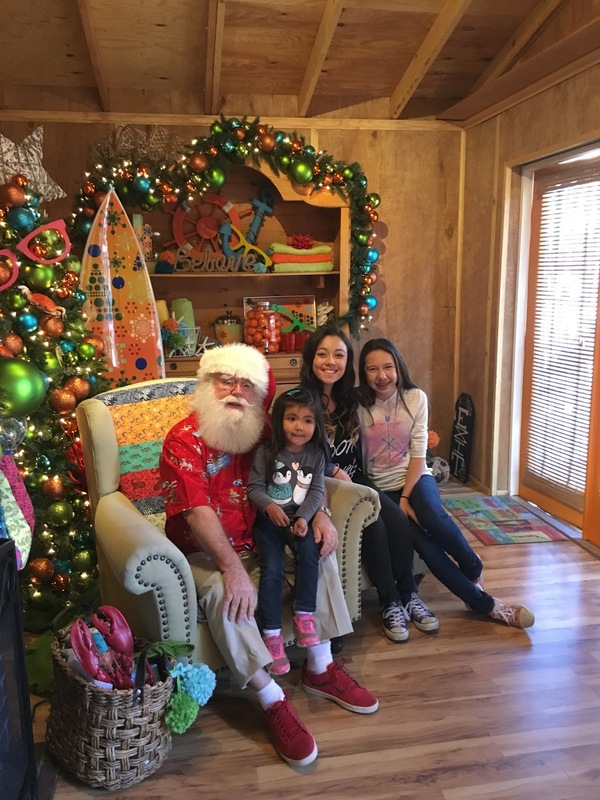 We all enjoyed family time, sharing a meal, playing games, and looking at holiday lights. It really was a perfect day. As I look at what we have accomplished this year, I am super excited to see what 2016 brings. 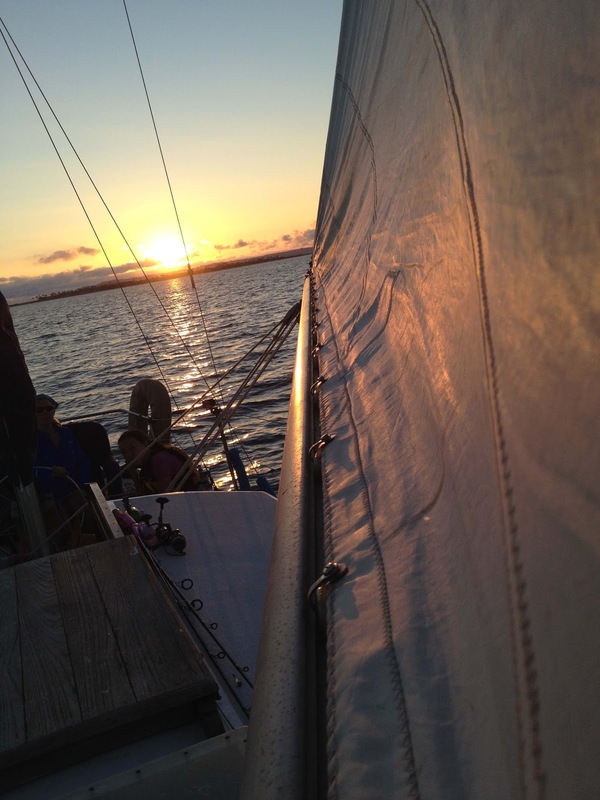 Each day we are learning more and getting closer to making our sailing dream a reality. It is sometimes scary to think that this time next year we will be celebrating the holidays on Empyrean somewhere in Mexico! The coming months are going to be filled with lots of work and tons of new experiences for the whole family. We will be working hard to get Empyrean ready for our travels, getting paperwork such as passports, registrations and licenses taken care of as well as lots of doctor visits to ensure we are all healthy and up to date on any required immunizations for travel. I am expecting a flow of emotions to accompany all of this activity as we prepare to leave family and friends plus no one really likes to get shots ;) and I am sure we will all have some apprehension to leaving the familiar. Overall there will be lots of excitement for what lies ahead. We can't wait to share all of the adventures of the coming year! Hopefully we can inspire others to realize their dreams no matter what those dreams are! It is possible to make a dream a reality! Stay tuned as we set out to achieve our dreams! We bought a boat!! After several months of working out details and negotiations we are super excited to say that we have purchased our new sailing home. 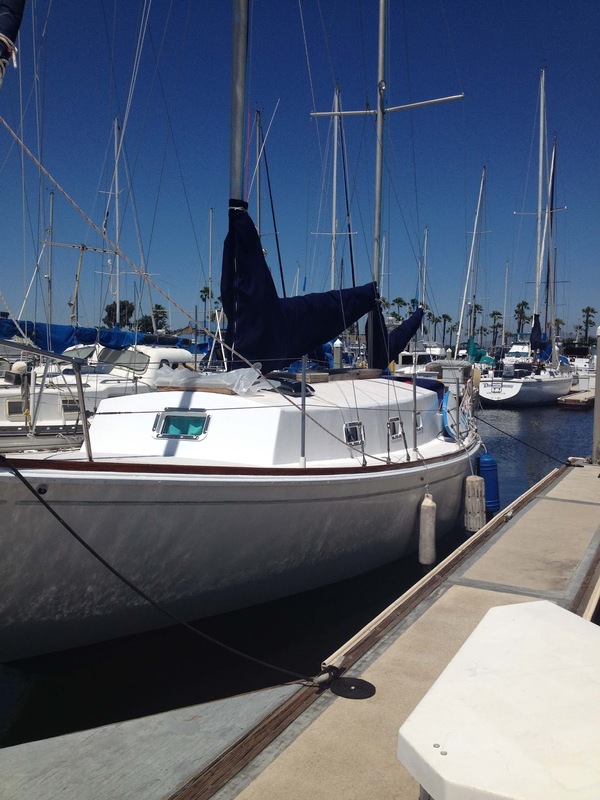 She is a beautiful 1979 Mariner 48 and we are super excited to move aboard. 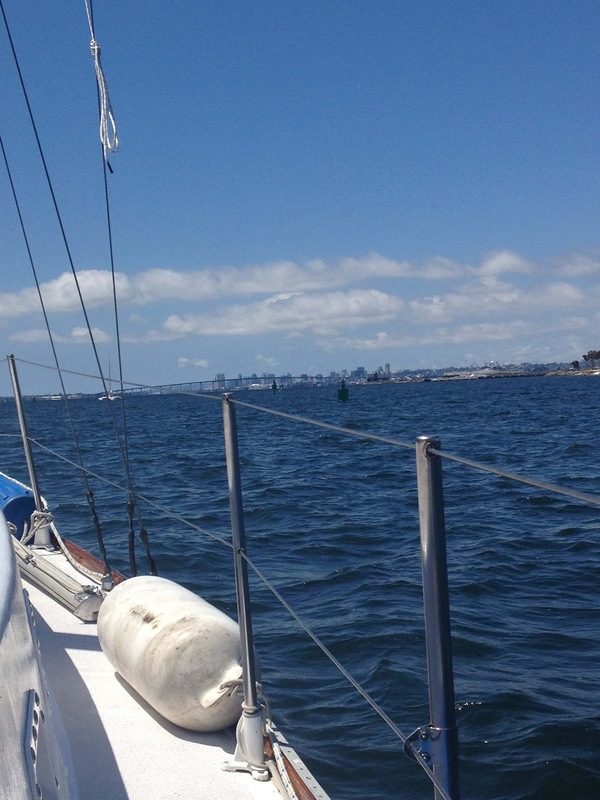 She is in need of some work so it will be a couple of months before we fully transition to living aboard, but we are one step closer to realizing our sailing dreams. We had searched for months before finding Empyrean but, the moment we stepped aboard, we knew she was the boat we had been searching for. The buying process took several months, as we went back and forth with surveys and negotiations. It was definitely a test of our patience but the wait paid off big as we were able to get a boat that was just what we were looking for at a price that didn't break the bank (at least not yet). We will be working on Empyrean over the next months outfitting her for offshore. We are currently working on replacing one of her diesel tanks. 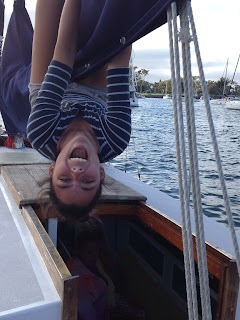 Upcoming projects will include new rigging and new electronics. We will also be removing the old heads and holding tanks and replacing them with composting heads. Follow us on the biggest adventure of our life as we prepare our new home to depart for Mexico in the fall of 2016! We will be adding lots of pics and videos of projects that we are working on! 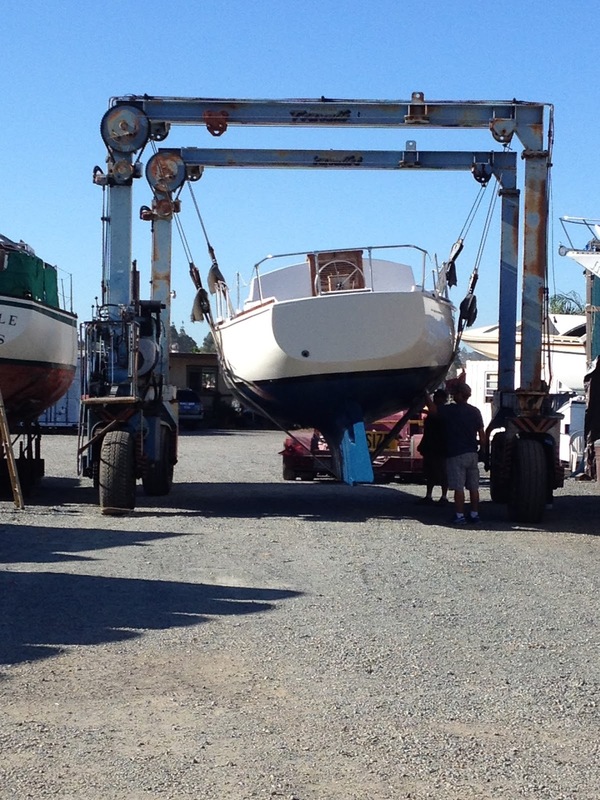 As many sailors know, repairs and upgrades for the boat never cease to appear. Our motto seems to be the same as Lowe's hardware store, "Never stop improving." 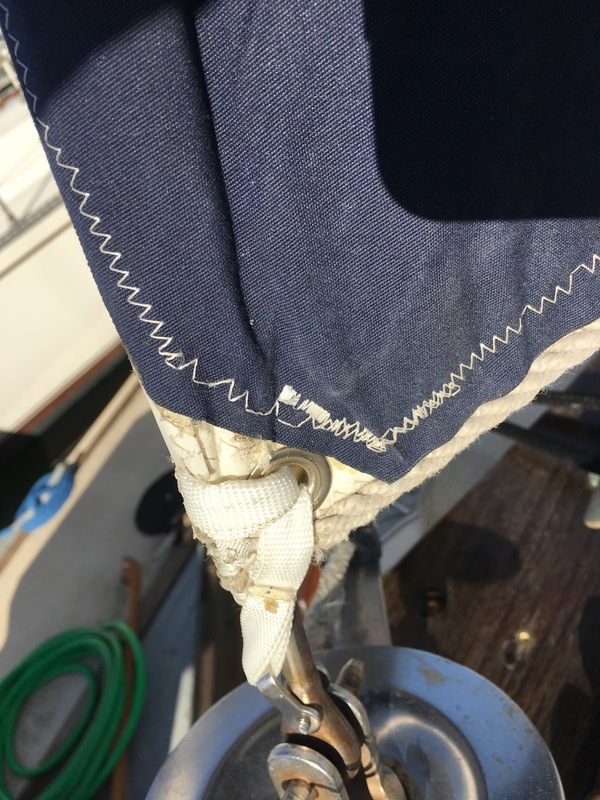 Our most recent repair is that of our headsail. A couple months back we tore the grommet on our poor old sail and were in need of a repair. 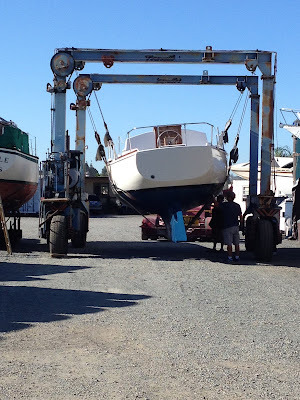 Knowing the owner pretty well, we decided to take it over to Kettenhofen Marine, a sail and rigging loft, for a check up. 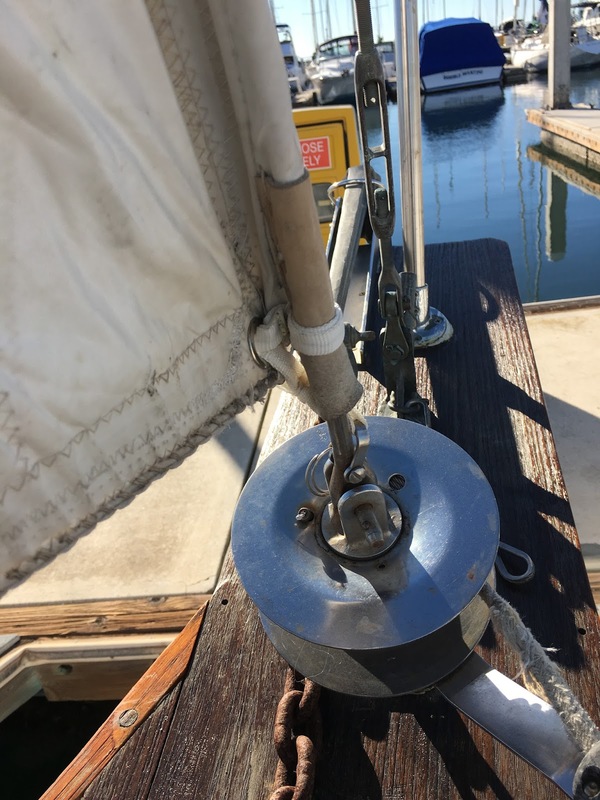 Mr. K had done a wonderful job repairing our sail and sent a list of what he had done to get our sail back in shape. He had to replace the grommet at the tack, restitch the rope, and replace two areas of webbing. Our sail is now in working condition and ready for some action! 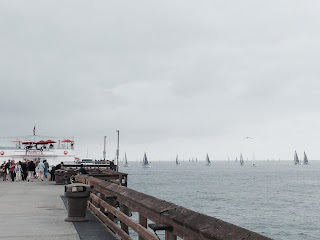 It has been quite some time since I have blogged, mostly because life has been crazy here. I promise that long absences are a thing of the past. I want to make sure that I keep the blog up to date, if for no other reason than to be able to look back on our progress. We have been very busy trying to get settled into some major life changes. Making life changes when you are a couple can be extremely trying so making life changes when it involves several kiddos can seem like an impossible feat. However, I am happy to say we are all adjusting even better than expected. was too complicated, too stressful and we needed a change. We had acquired too much stuff, too many unnecessary worries, and overall our minds and bodies seemed cluttered with things that just weren't enjoyable. 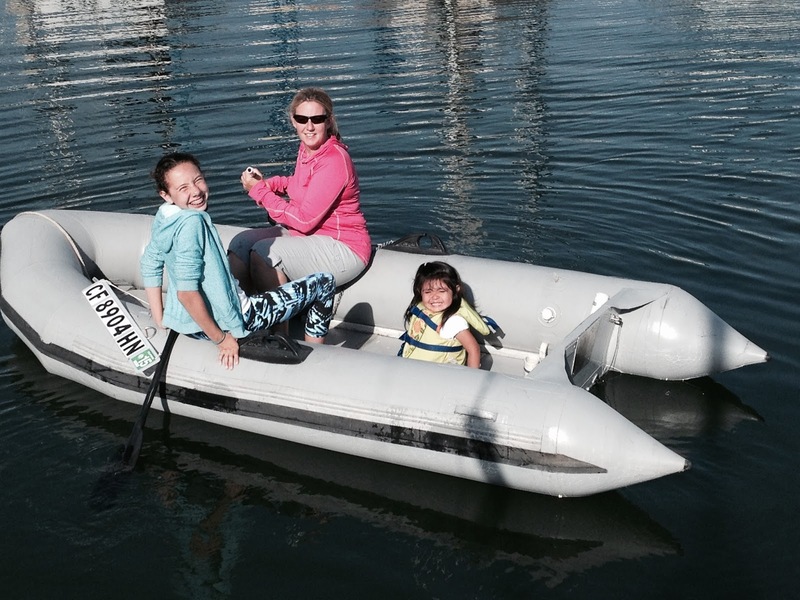 After purchasing Southwind and refitting her we knew for sure that the sea was calling our family louder than ever. And so we went to work evolving a plan. Our first step would be to get rid of stuff that was tying us down. This may sound easy and I thought, since I love to organize and clean out, that it would be relatively easy work for me. Boy was I in for a rude awakening. We spent weeks, going through everything that we had collected, trying to pair down to necessities. 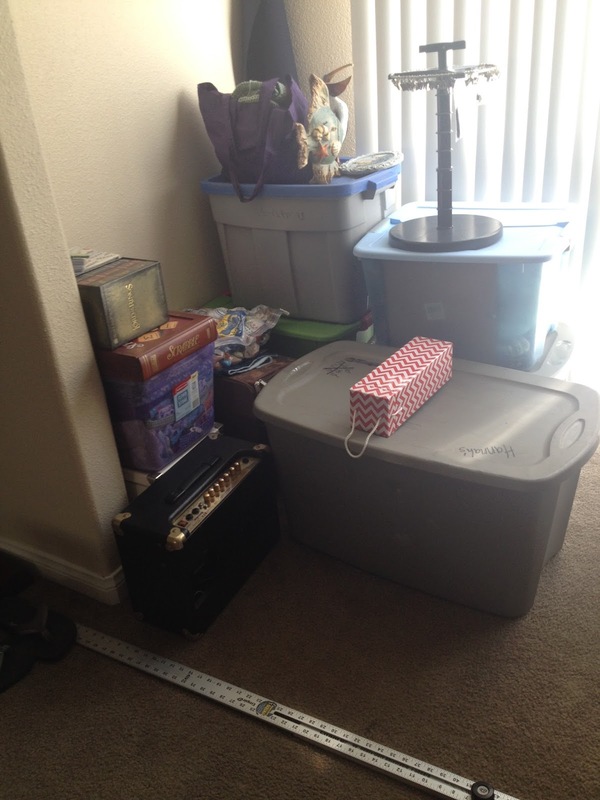 I taped off a section in our family room and told the family that everything we would keep needed to fit in this small space (approximately 6x8). 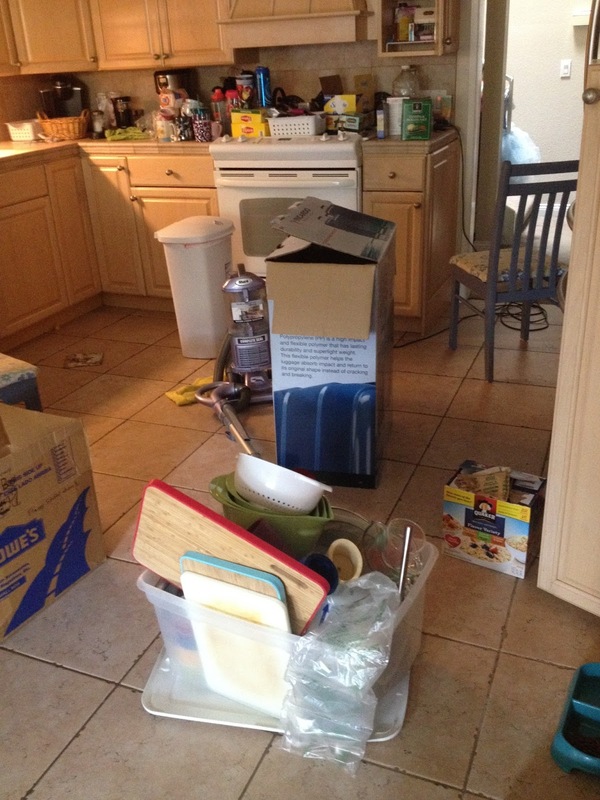 We began to pile things that seemed important into the space and it began to fill up…fast! Then we would reevaluate and more stuff would be piled into garage sale piles. Before all was said and done we would have three garage sales, multiple ads on Craigslist and Ebay, of course carloads to take to charity, and a huge trash collection day. The more we let go of, the more weight that seemed to be lifted. We really started to feel good about going tiny. By the end of September we were ready to make a move out of our 5 bedroom home. This brings us to where we are today. We have moved into our travel trailer and are embracing the simpler life. It is crowded, but we are finding ways to make life work in small spaces. There are five of us and one bathroom vs. the luxury of three bathrooms. We are learning so many things like patience, new organizing skills, and more importantly how much we can enjoy each others company. We are playing board games, cooking together, and just enjoying being a close family. 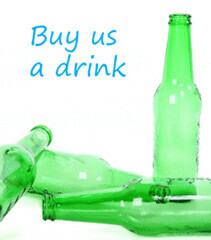 We are discovering new ways to leave a much smaller footprint everyday. It isn’t all perfect bliss but we can truly say we are happier than we remember being in a long, long time. So, where will we go from here? Well, we are certain that a bluewater cruiser is in our very near future. We have some things in the works and are excited to soon be sharing news of a new, much more permanent, home. Happy Halloween everybody, it's been awhile since we've updated hasn't it. 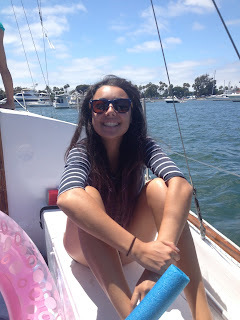 We are still here and still trying to achieve our goal of living the sailing life. We have been busy downsizing from our 2600 sq. ft. home to a 27ft travel trailer and let me tell you that it is a lot harder than you might think. We are moving in to our trailer for now till we find our new blue water sailboat that we will begin our sailing adventures on. We'll post about our downsizing in another blog. 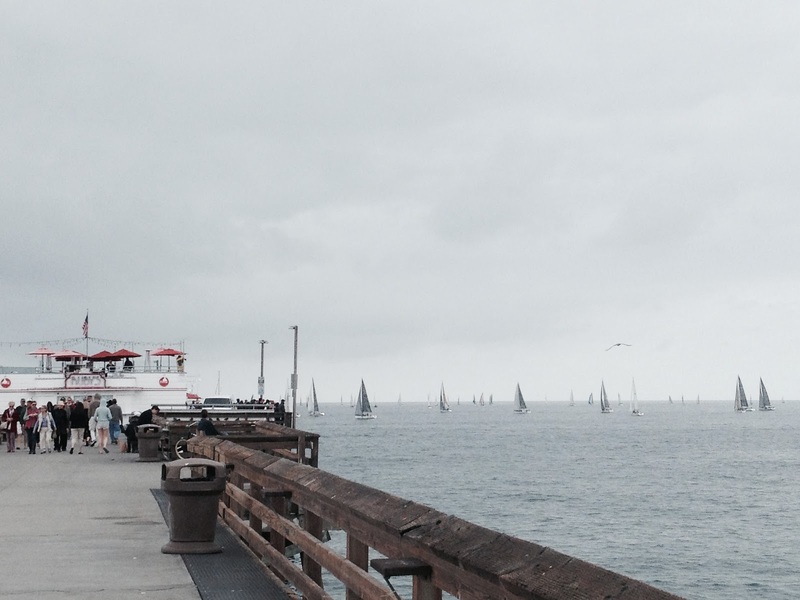 Fair winds and thanks for reading. We have been busy working on Southwind and getting in as much sail time as possible! We have managed to get the engine running beautiful and we are now able to motor whenever necessary without worrying about overheating! (Whew!!) 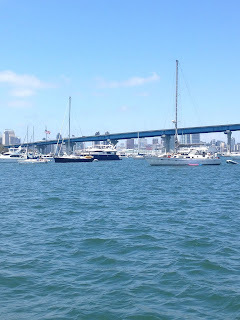 This was a huge relief since winds can be shifty out on San Diego Bay and outside of the channels are very shallow areas which with a huge keel can be very hazardous. We like to know that we have that engine ready to go if we need it! After some trouble shooting we also realized that our alternator was bad and we began the hunt for a replacement. We did another oil and filter change and replaced the fuel filter/water separator. After doing a lot of research into the Westerbeke engine overheating problems, Tom was able to learn from others how putting in a bypass around the water heater would help keep the water flow pressure up to help keep the engine cool and VOILA! we were in business! 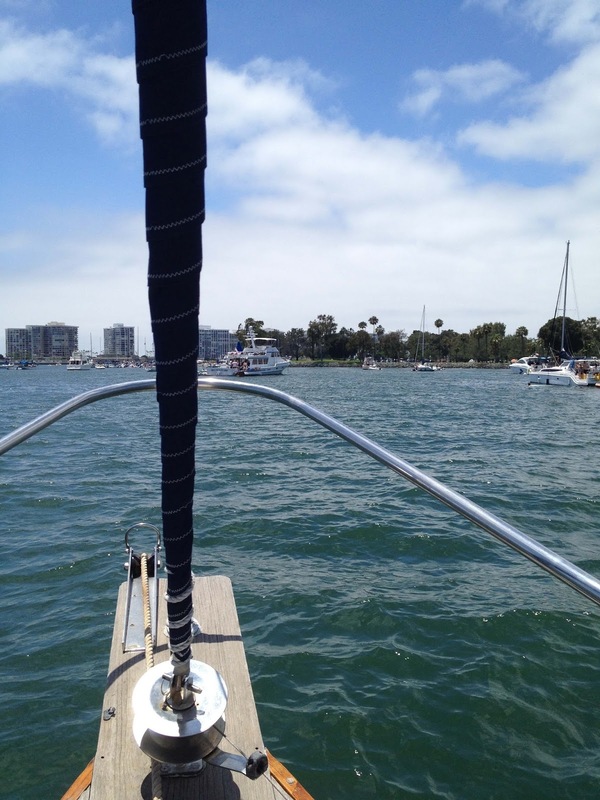 Thanks Downwind, for some great new life lines! 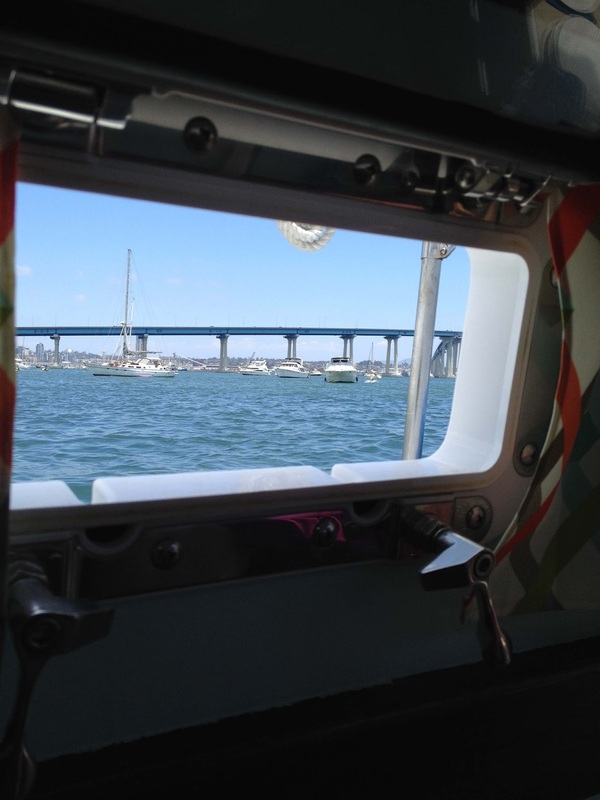 We have also installed a swim ladder, GPS, batteries, and some interior lighting. The project list seems never ending but we are really enjoying learning everything we can about outfitting our boat for safety and comfort. 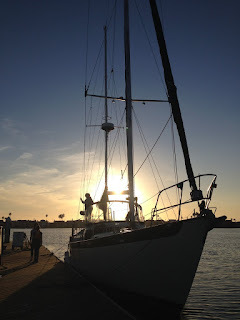 We were able to spend a few nights on the docks and get a little sailing in. We had our first anchoring experience at Glorietta Bay and it was amazing! 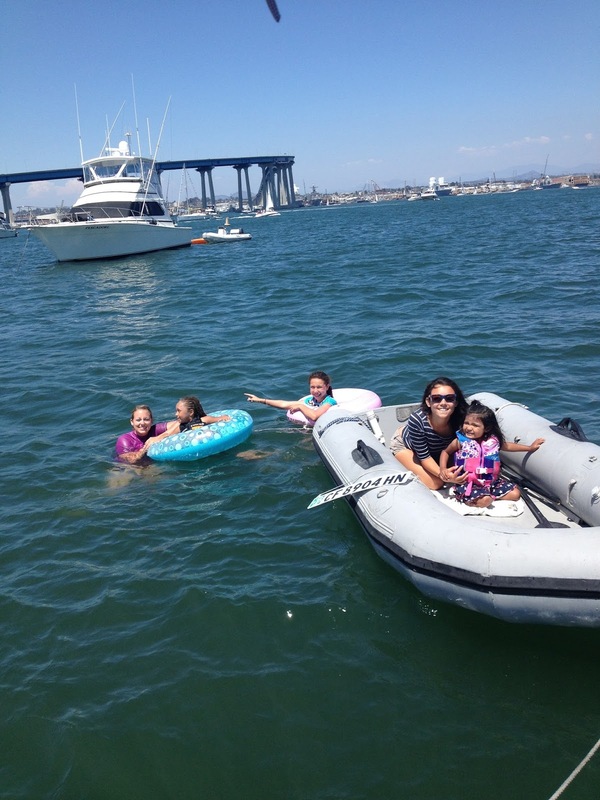 The girls and Tom were able to take the dinghy ashore and check out the beach, the girls also did a little swimming. Watching everyone have such a great time makes all the hard work worth it! 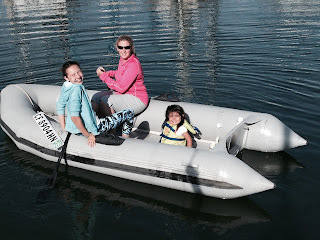 Happy faces after a great sail! Our engine is still running a bit hot, but in defense of the engine, we did forget to open up the raw water intake seacock when we first started the engine. (Oops!) 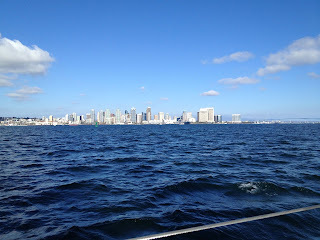 We sailed through the ship channel and out into San Diego Bay. Most of our short two hour sail was spent getting a feel for how well she maneuvers and practicing adjusting our sail trim. 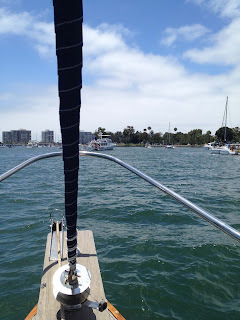 We probably would have stayed out even longer, but after an hour or so, the battery on our handheld VHF died (we forgot to charge it, "oops" #2). At that point we decided to head back, afraid that we were asking for trouble by being out without a working radio. Overall, it was such a fun afternoon. It also happened to be Hannah's first ever sail, and she loved it! Big win! 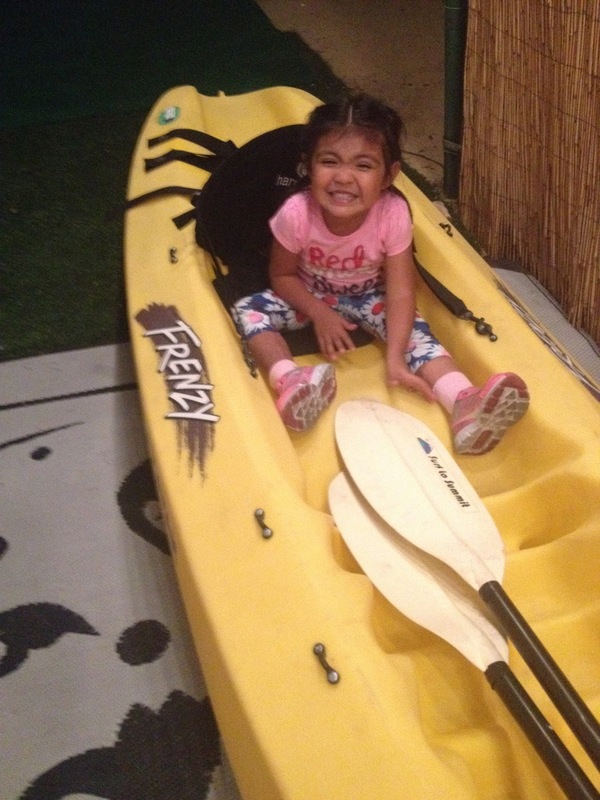 (Not really sure what we would have done if she had hated it, HA!) She was definitely nervous at first, but got a feel for it after a little while. 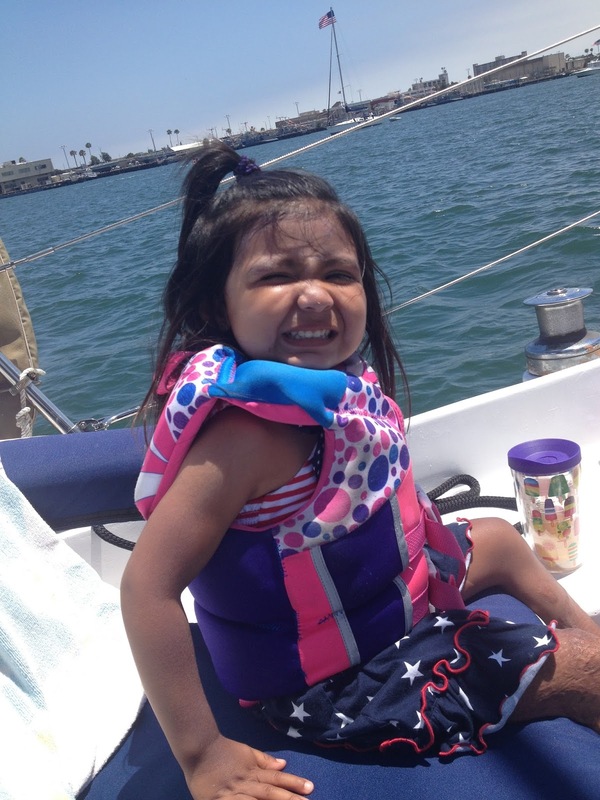 She especially loved it when Dad let her be the helmsman for a bit. 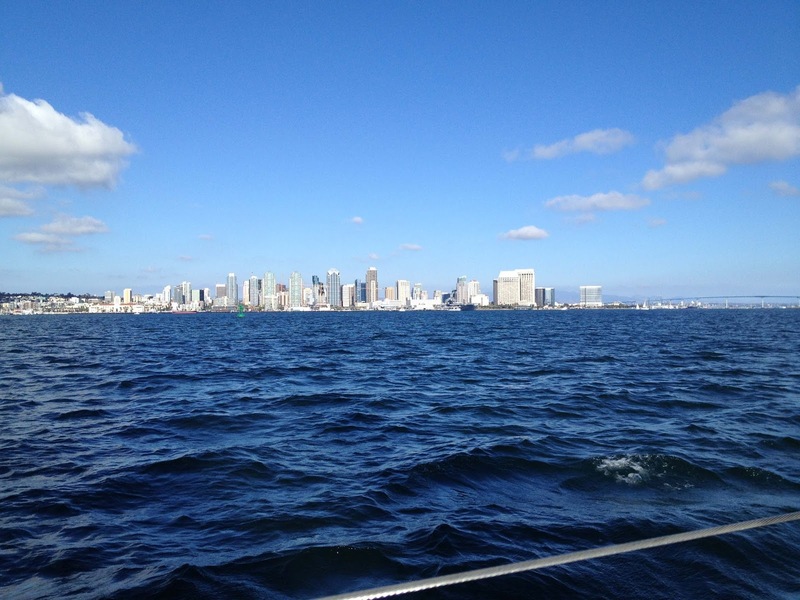 It was perfect weather, a beautiful afternoon, and we couldn't have asked for a prettier day! The only downside of the day, we were missing one of our crew members. 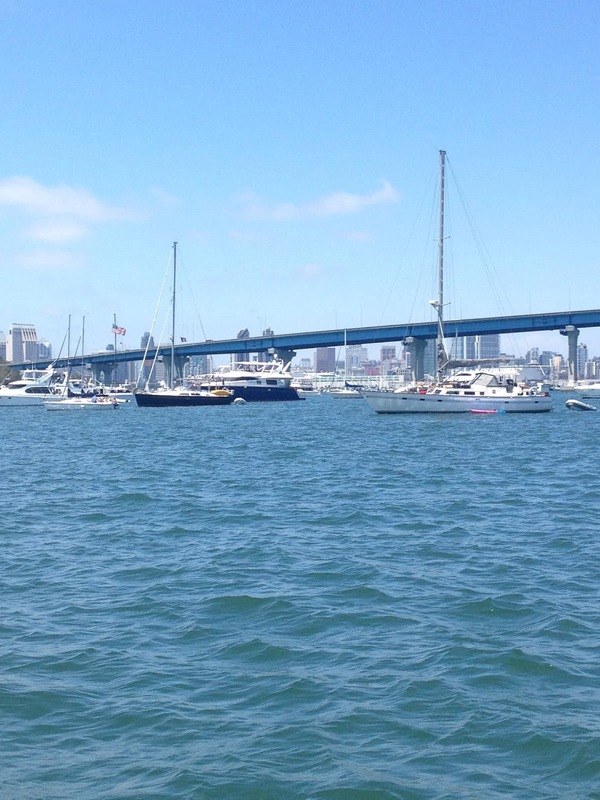 Emily participated in the Newport to Ensenada race as part of the Newport Sea Base Youth Race Team. 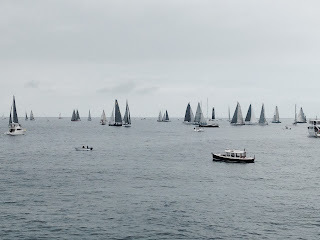 Unfortunately, the weather was against them, and a huge number of boats, including Emily's, were forced to drop out of the race. But she had fun, nonetheless, learned a lot and had a ton of stories to tell about her adventure when she came back! 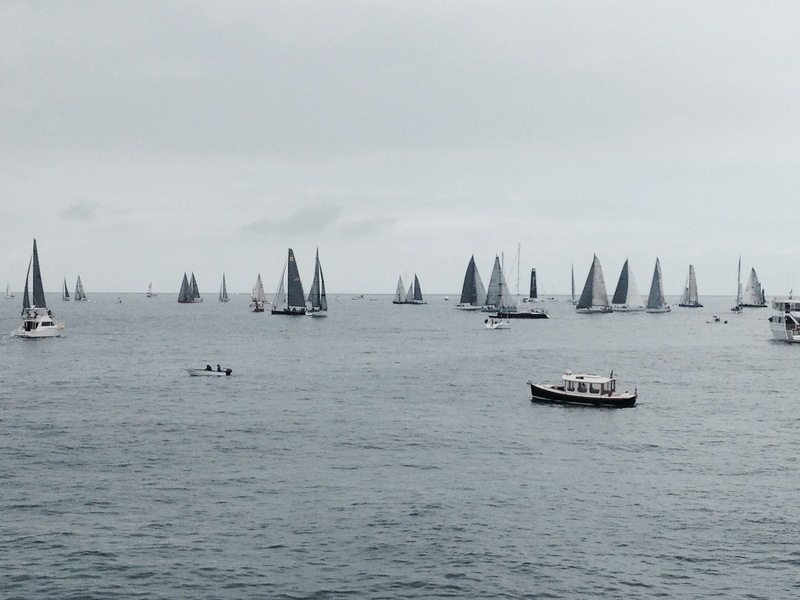 You can check out some pics of the race start below.